(Nanowerk News) In very cold climate zones, the wind can blow with tremendous force. But wind turbines have rarely been built in these regions up to now. The risk of ice formation on the rotor blades is just too high. But now, an energy-efficient heating system frees these turbines from the ice in a matter of seconds. It is only switched on when water freezes. A number of companies shy away from building wind-powered systems in northern regions, even though the wind blows with great power there. To begin with, weather conditions represent a Herculean challenge: Aerodynamic properties deteriorate when an ice layer forms on the rotor blades as temperatures drop to the below-zero range under freezing storm conditions. The turbines produce less energy. The inexorable redistribution of the loads disturbs the overall balance, which furthermore means the blades might breakdown faster. On top of this is the safety risk associated with icicles breaking off. When the risk of ice formation arises, the operators will immediately shut down the systems. Annual power production becomes markedly diminished – the ice accumulations cause power losses ranging anywhere from 14 to 20 percent. Despite the vast potential, wind turbines are consequently much less likely to be constructed in cold climate regions. This is where the EU’s “Windheat Project” steps in: Working in joint collaboration with six corporations from four EU states, researchers at the Fraunhofer Institute for Manufacturing Engineering and Automation IPA in Stuttgart are developing an energy-efficient ice detection and anti-icing (or de-icing) system for small wind turbine power generators. Periods of weather-related downtimes should be avoided this way. Existing anti-icing systems are energy-intensive, since they have to heat up the entire rotor blade – regardless of whether entire blade is actually affected. But with “Windheat,” the project partners are taking a different route: This rotor blade is divided in to a variety of zones that were each finished with a carbon nanotube (CNT) coating. 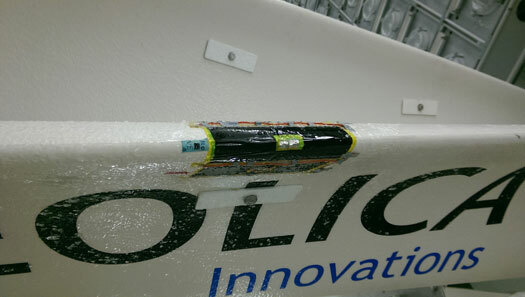 Then, a separate ice detector is integrated into each individual CNT layer. “Our carbon nanotube coating only heats those zones that are actually iced up. These are the edges of the rotor blade, first and foremost,” says Anne Gerten, scientist at IPA. These tiny, sensitive probes are constantly measuring temperature and humidity at the surface, react to the slightest fluctuations, and detect when water freezes. If ice is detected, then, in a matter of seconds, the detectors switch on the heat element that supplies the corresponding CNT layer. Once the ice has melted, the heat is automatically switched off. “With the combination made out of CNT coating and sensors, we can target and heat the iced-up zones and essentially, only when it is actually required,” adds Gerten. The goal of the project is to increase energy efficiency by at least 18 percent, using this de-icing strategy. The CNT layer, just a few micrometers thick, can be applied to the rotor blade with ease. It is applied by spraying CNT onto a self-adhesive polymer film. Clear-coat insulates the coating and additionally protects it from humidity and mechanical effects. The researchers selected this material because of its excellent mechanical properties. “In principle, these carbon nanotubes are wrapped layers of graphite that touch each other in various places. At these contact points, the electrical current is converted into heat,” the researcher explains. Which areas of the rotor blades are especially susceptible to ice build-up? In the project, they used computer simulations to figure this out. Above all, the edges of the blades turn out to be the neuralgic points. The IPA researchers were able to confirm these findings through tests in the wind tunnel. At minus 30 degrees Celsius, in ice, rain, and with wind speeds of up to 120 km/h various prototypes were tested under real-life conditions. Among other things, the scientists outfitted the rotor blade of a small wind turbine generator with the CNT coating. Getto considers aviation to also be a potential field of application for the Windheat System – which could deice airplane wings.